The Art Of Feeling Good unveils Àse Yoga, a self-healing practice that transcends our obstacles and transforms our lives. African American women in the United States and the Diaspora share a unique history, which has affected how we feel about ourselves. Something happen, yet we don’t talk about it. But, even if we choose not to deal with the chaos of the past, the suffering of our foremothers will not fade away. Knowing the history is not enough. Healing from the “enslavement process” is crucial to connecting with our beauty and feeling good. 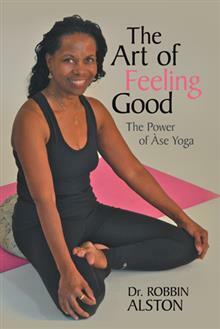 In The Art of Feeling Good, Dr. Robbin Alston takes us on a journey to the balancing power of Àse Yoga. As a guide, this book encourages African American women to begin embracing and re-claiming yoga as practice for healing. Using our ancient mystical systems, knowing who we are, reconnecting with a universal holistic spirit-mind-body energy practice, with Àse Yoga, we begin to re-member, to re-discover our real identity. It’s time to feel good. The Art of Feeling Good offers a path to wellness, right relationships and mindful choices. This book shares with you an empowering healing process that supports your journey toward self-realization and feeling good. Dr. Robbin Alston earned a BA in psychology from LaSalle University and a master’s degree and PhD from Temple University. She is an Adjunct Professor at Lincoln University in Lincoln, Pa. With an advanced training in classical yoga, her yoga practice extends on the mat as well as off the mat. She is the founder and owner of Àse Yoga Studios and Tea Room in Philadelphia, Pennsylvania. Dr. Alston teaches and lectures about Àse Yoga throughout the United States. Robbin is giving away a $25 Gift Card!